The image of the horse is so popular and appears in so many forms that there are literally millions of fascinating equine collectibles to seek out, accumulate, and admire. Collecting them is a passion for thousands of people; this wonderful new second edition was put together with them in mind. 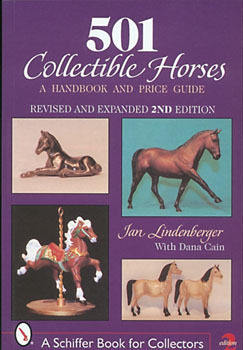 With over 500 examples, it covers major toy manufacturers like Breyer, Hartland Plastics, Hagen-Renaker, Marx, Hasbro-My Little Pony, and North Lights, plus a wide range of horse collectibles in a variety of materials and forms, gathered from around the world. All of these have newly revised pricing information to reflect today's market.Horse collecting is a hobby suited to any budget. It's not hard to find horses to buy, and many of them are priced very reasonably, even in antique shops. With the wonderful color photographs and its current price guide, this book will be a useful delight for horse enthusiasts.